I saw this recipe on Masterchef some time ago and thought I’d never get this one right!! It is easy as and incredibly tasty, a big winner among friends…and looks very impressive too! Go on, give it a go!! Step 1: Cook the eggs in boiling water for 7 minutes and then chill in iced water until cool enough to handle. Peel. Step 2: For the prawn paste, pound the shallot, garlic and ginger in a mortar and pestle to a paste. Add prawns a little at a time, pounding well and moistening the pestle with fish sauce at regular intervals. When the mixture becomes thick and pasty, pick up the paste with your hand and throw it into the mortar repeatedly and with force, until it feels light in your hand. Step 3: Take each egg and roll first in flour, then beaten egg and with wet hands form the prawn paste around the eggs to totally enclose it. Dip the coated eggs into flour, then beaten egg, then crumbs. Deep fry at 170°C for about 5 minutes until golden brown. Remove with a slotted spoon and drain on paper towel. Step 4: For the sambal, fry the shallots, garlic, chilli and ginger in the oil until soft. Add the fish sauce, kecap manis and palm sugar and cook for 5 minutes. Add the coconut and cook for a further 2 minutes until the liquid has absorbed. Stir through the chopped coriander. Serve the sambal with halved or quartered scotch eggs. This entry was posted on July 20, 2010 at 8:33 am and is filed under Cooking, Family, Friends, People, Personal, Random, Recipe. You can follow any responses to this entry through the RSS 2.0 feed. You can leave a response, or trackback from your own site. May I have a share, please? Different. Clever. Prawns and coconut et al instead of sausage, I take. Gotta’ try this one. Thanks for posting, Amanda. Another goodie! 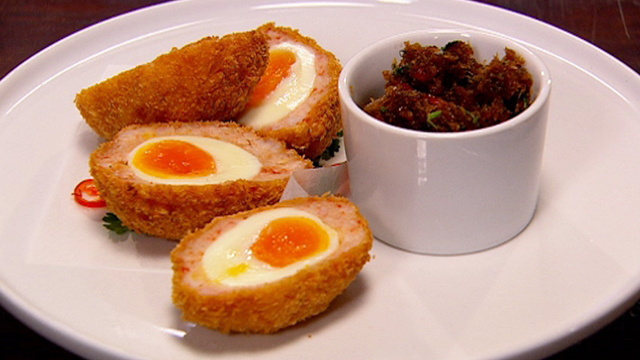 What an inventive twist on Scotch eggs!